The leaders of organizations adopt Lean management in the hope of achieving desirable outcomes such as higher quality, shorter lead-times, lower costs, and so on. In most cases, cost reduction is a major objective and is of particular interest to senior managers. Yet, the magnitude of cost reduction achieved usually ends up being far less than they anticipated. When people’s Lean efforts fail to achieve the desired cost savings, Lean management is typically abandoned and can therefore be said to have failed. The inability to reduce costs is the result of a Lean transformation process problem. Specifically, a major defect in the process: a lack of kaizen. Not just any kaizen, but a lack of Toyota-style kaizen. The core of Toyota’s production system is kaizen. The core of Lean — an interpretation of TPS made by researchers at Massachusetts Institute of Technology — is not kaizen. The core of Lean is value stream maps or A3 reports or something else. But it is not Toyota-style kaizen. Therefore, one would expect the vast majority of Lean transformations to result in less cost reduction than expected and eventually fail. Before you can reduce costs, you must first understand what costs are and also what non-cost costs are. This is nearly impossible to understand given people’s reliance on computers, spreadsheets, and calculations to inform their thinking about costs. Non-cost costs are not even considered. As a result, neither are truly understood – not by senior managers and definitely not by the chief financial officer. Toyota-style kaizen teaches managers and employees to understand what are costs and non-cost costs. If an organization does not practice Toyota-style kaizen, then these people will not learn what are costs and non-cost costs. As a result, they will have difficulty reducing costs. If there is no kaizen, or bad kaizen, then there will be little in the way of cost reduction. It will not be long before Lean is seen by all as just another management initiative that failed. And, organizations that do not practice Toyota-style kaizen will not generate cost-awareness. Knowledge of cost is incomplete without cost awareness. Most organizations do not practice Toyota-style kaizen. They practice weak, derivative forms of kaizen that have little impact on costs or other important parameters. People look busy and look like they are making meaningful process improvements, but the fancy talk and the colorful charts are mere decorations intended to impress company leaders. This is unfortunate because employees have good intentions and put a quite a bit of effort into making improvements. They want their efforts to yield tangible results, but in most cases they have a only slightly improved process and have not reduced costs. Non-cost-costs are largely untouched, and cost awareness is not developed. Toyota-style kaizen means to persevere in the face of adversity with an intense hunger to survive. It means learning to think like a craftsman, using mostly your own ingenuity and little in the way of resources. If you don’t have expensive equipment or other significant resources at your disposal, then you have to think creatively about how to quickly design and execute the process. 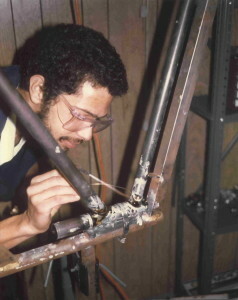 The summer after graduating high school in 1976, I undertook the challenging task of designing and building road racing bicycle frames. I had little money, most of which went to buying the tubes and detail fittings. I could afford only one power tool: an electric hand drill. All other tools were hand tools: hacksaw, files, tube cutter, C-clamps, hammer, tape measure, ruler, and so on. No lathe, no milling machine, no drill press, no jig bore, no belt sander, and no band saw. I had to figure out how to manufacture a quality product that functioned correctly on the road for decades using only hand tools in a space of less than 100 square feet. Using my ingenuity, I devised methods to finish the detail fittings, hand mitre the tubes, slot the tubes, hold the tubes while brazing, and so on. Then, I improved my processes as I proceeded to build additional bicycle frames in the following months and years – with no expensive new resources. Toyota-style kaizen means to improve a complicated process by making it vastly more simple, much in the same way that I manufactured bicycle frames – a low-cost, far less capital-intensive method, where technology is used only when it is clearly necessary. And all improvements must result in improved material and information flow. I hope this helps give you an idea of the mindset, spirit, and overarching objectives of Toyota-style kaizen. That is the approach you should be taking. The result, among many other great things, will be cost reduction. Nicely stated – most don’t grasp the reasoning of why the improvements don’t directly show on the bottom line. However, that does not mean the improvements are not valuable regarding the non-cost costs. Ease of manufacture creating a better environment for the employee which leads to increased job satisfaction/less frustration; cost avoidance such as safer work practices or reduction of escapes/reworks; product improvement; all are examples of very valuable outcomes to not be taken lightly. But unfortunately, in today’s environment, many only pay attention to the immediate dollar sign. Great article! I am Tim of the Lean Japan Study Tour. I live in Tokyo and have been organizing TPS and kaizen tours in Japan for mostly non-Japanese people with a passion for Lean. Cost awareness in kaizen indeed is a decisive element, but the major difference that I notice between Lean in the west and TPS in Japan is that Toyota seems to understands very well the hidden motive behind kaizen i.e. to revitalize the people and their workplace, what they call in Japanese ‘shokubakasseika’ (職場活性化) or ‘revitalization of the workplace’. This is a major difference between traditional TPS on which Lean is based and Total-TPS, which is a more recent development in Japan of TPS. The two main principles that come into play here are ‘respect for people’ (ningenseisonchou 人間性尊重）and ‘kaizen’ (改善). Respect for people means that Toyota understands the huge importance to tap into the creative abilities of people and how this revitalizes and motivates their employees. Kaizen is Toyota’s way to realize this idea. This plus another element of the Toyota Way, i.e. ‘developing people first’, make up a substantial part of Toyota’s cultural identity. I think that where many companies in the west fail with their Lean transition is that they try to use kaizen as just a tool and not as a means to revitalize and develop their people. And as you wrote cost awareness indeed plays a major part in this development as does quality, lead-time and safety awareness. As with all transitions, they only succeed if your identity has already become the change that you envision. Cost reduction as a standalone will definitely not yield sustainable results. Hi Tim – Thank you for your insightful comment. It is quite strange that so many companies do not do kaizen, and the leaders also do not understand the importance of kaizen in developing people. The revitalization aspect that you point out is very important and is another aspect of kaizen that is not well understood. This is a good article Bob. After 16 years of Lean / CI work I have only worked on one programme that really understands this subject. I was fortunate to work under Professor Yamashina to learn and implement his World Class Manufacturing programme, which has ten pillars. The Cost Deployment pillar focuses on all cost’s associated within a business and understands the full cost of a process within a plant. The square meters of a process is calculated so that the plant overheads / fixed costs can be apportioned to each process. By understanding your real cost base you can attribute a realistic cost to each identified waste and loss in a process, therefore when you make an improvement through Kaizen you can show a real tangible saving to the business whether it be a hard or soft saving. You must also remember to calculate how much your Kaizen is costing the business and offset this against the benefit. The cost of the Kaizen will include labour, tools, training hours etc. Another pillar is People Development which is fundamental to the success of any Lean / CI programme. Without developing and growing your people with the necessary tools and techniques you will not transform an organisation. It is important to train and develop people before a Kaizen event so that they can go on to lead their own Kaizen and deliver more benefits to the business. People development and engagement is critical for the success of Lean transformation so for me is the most important pillar. With one drop of water you will not get very wet, but with a shower of rain you will be soaked. Use this analogy for developing your people and transforming a business. Thanks Neil. I like your analogy. Nice! Hi Bob. During a tour of Toyota in Japan years ago my guide showed me numerous examples of kaizen, many I would describe as ‘quaint’. When I asked about this he said it wasn’t about the size of the monetary savings but the thinking. My personal experience is that with lean, managers are always asking to ‘show me the money’ with regard to cost reduction. There tends to be a single focus on cost reduction. I do agree organizations should share more information with their folks about elements of cost. It is why I always encourage a type of ‘where does it go’ educational piece as part of associate development. Interesting conversation. Yes, the way of thinking is indeed is most important. I understand all the dysfunction that comes from focusing on cost reduction in a zero-sum manner, as most leaders do. In the early 1980s, Yasuhiro Monden provided an accurate representation of TPS as non-zero-sum cost reduction. This got lost in the Lean translation a few years later. See https://bobemiliani.com/yasuhiro-monden/, bottom third of the page that quotes Toyota Production System (first edition, 1983, page 2), et seq. This is the description that should have been carried forward into Lean (with credit given to Prof. Monden), but it was not. The MIT researchers made a major mistake in this regard. They mostly ignored Monden’s fine work. Great comments in this conversation! Talking about Kaizen, it may not be entirely clear to western people that there are more than 1 type of Kaizen in Japan. Toyota has QC-circle based kaizen: small teams usually spend about 3 months (meeting approx. 2 hours per month) on a selected issue connected to their work place (quality, productivity, cost, safety, …). The aim is to develop employees. Further they also have a creative ideas proposal system (創意工夫提案制度）welcoming individual as well as group proposals. These are the small daily kaizen rather than the big ideas. The aim is to create a company culture in which each and every employee thinks about kaizen on a daily basis. These small kaizen deal with daily activities and focus on productivity, quality, safety and/or cost issues. Toyota people often define TPS as the accumulation over time of small wisdoms of all its employees. Accumulation of small improvements leads to big results as they say. We also shouldn’t forget Work Kaizen (Saigyo Kaizen 作業改善) which focuses on human movement and is about improving standard work and reducing MUDA. And last but not least there is the Advanced Kaizen (Senko Kaizen 先行改善) which is a part of Simultaneous Engineering, and for which they use Obeya (大部屋), to anticipate and improve problems in order to smoothly launch a new product line (I think this is especially valuable for complex adaptive systems). However, I believe that in the end the real kaizen strength of a company can be seen especially in the small daily kaizen as this is an indication of how much the people at the gemba are involved in and are stimulated to continuously improve what they are doing. If an organization does not make the effort to develop the people who are actually creating the value, the lean initiative will never be part of the company culture and is therefore bound to fail. When taking along people on our Lean Japan Study Tour, I am always surprised that many of them are unfamiliar with Small Kaizen. Big process Kaizen definitely have its value, but I think that it are the daily small kaizen of the people working at the gemba that make a Lean transition sustainable. This, of course, combined with an effective policy deployment or hoshin kanri (方針管理) as a guiding force. I always recommend teams to approach continuous improvement in systemic way. We cannot increase cost awareness without increasing value awareness first. I really respect Toyota kaizen-style and it needs to be adjusted when applied to complex adaptive systems like construction projects or it won’t work. Cost reduction is a derivative of the value system and not an input when you practice continuous improvement in complex adaptive systems. Also in CAS values and processes are fluid, they change over time. We must cut the umbilical cord from Toyota’s approach if we want to grow. Toyota does not own the absolute truth but it is a strong reference to help us pave our way for continuous improvement in our industries without loosing our identities. I believe the root cause for failures in building a culture of continuous improvement (even cost reduction) in projects or organizations are related to not have the right governance system in place. When people ask me to help them create a continuous improvement culture in their organizations my answer is: Are you ready to redesign your governance system? I have trouble picturing myself explaining to a manufacturing professional what a “non-cost cost” is. Could you elaborate? I don’t have any trouble seeing you do that! Of all the people I know, you are perhaps the most capable person to explain it. Thanks for the vote of confidence. The problem is: I have no idea what it means, and google doesn’t either. It knows about “non-cost data,” but not about “non-cost costs.” Since you use it multiple times, I assume it’s not a typo. Accountants have been trying to agree on what costs are for a couple centuries, and are still at it. In their textbooks, they dodge the issue by pretending it’s self-explanatory. I’m going to go ahead take credit for two things: 1) The term “non-cost costs” and, more importantly, 2) knowing something that Google does not know. I agree, what are “non-cost costs”. Its not clear to me in the article. It tells us we should understand it and that Toyota understands it, but there is nothing I could interpret in that article to help me understand it. I got that I should, but nothing that tells me how or what. I liked the frame of the story about improving through simple means, but not sure how it all ties in together. I struggle with that. I see us often debate and analyze and put in charts if we should use a hammer or a saw to drive a nail. We discuss, we meet, we put up charts and provide presentation to say, “we should use the hammer” when all along we had skilled craftsmen to that knew all along that the hammer was the choice. I have heard the terms Non-cost costs before, but I like Michel scratch my head when I here what seems to be buzz words. So I’m not an accountant but I have general and detailed working knowledge of accounting practices. GAAP and FASB and those good ole operational cost accounting methods that have been around forever. So in the context of accounting verbiage are these non-cost costs Fixed and/or Variable? If they are, could you offer some examples of non-cost costs, either Fixed or Variable. I worked with 3 past Toyota employees, one was my Sensei from OMDD, one worked in paint, one worked as a team leader, they were all my teachers but none of them ever mentioned these terms. So, if the term “non-cost costs” was not mentioned by Toyota people or did not originate with Toyota, it is invalid? Fixed and/or variable? Does that make a difference? What if it were both? TPS evolves, not just in Toyota people. Please think harder. Respectfully, no it wouldn’t be invalid, no it makes no difference and they could be both (and/or) and I agree it evolves. My question was if you could share some examples based on your experiences. It has been my experience that we lose something in translation of the Japanese terms. Sammy Obara told me that the kanji for Kaizen includes the human element of self sacrifice. Meaning, Kaizen includes the element that the individual gives up their beliefs for the good of the team. This is in line with what I learned while at Toyota, the Kaizen team teaches how to work and solve problems in teams. There is a practical aspect to the Kaizen culture. If you are lean then you expose problems and there are very many problems. If you have to wait for the manager or engineer to solve the problem then you are waiting a very long time. Consequently, everyone has to solve problems to keep sanity and the enterprize running. I see many “non-cost costs.” The most classic would be the under-utilization of people. This form of waste unquestionably “costs” the business – but it really can not be specifically identified on the income statement, or treated through traditional accounting methods. Isn’t wait time / queue time a form of non-cost costs? It probably does not appear in any p&l but it has side effects. Higher inventory needs, more space, cost of delay, etc. If you do pure cost accounting and manage from a spreadsheet, no chance to see this. Only Gemba/Kaizen can put management in touch with those hidden costs. Like many other words in the TPS/Lean lexicon, I struggled long & hard to understand the real meaning of the word Kaizen. My breakthrough came from the realisation that real understanding of the meaning of a word was not to be achieved from the study of the characters & letters of the words themselves; but from studying the behaviour, attitudes & results they create. In Zen Buddhism the measure of a teacher is not their own knowledge of a subject, but the understanding they can give to the people they teach. From my studies & practical applications over 26 years I evolved the following explanation. Kaizen is an overall set of attitudes, behaviours, tools & techniques. I have found the best way to help people to understand Kaizen, is to explain why they need to do it, & the benefit they will personally gain from doing it. At the start of our Kaizen workshops, I draw on a flip chart pad a man walking down a road followed closely by a road roller, I write on its speed as 3mph. I then ask the delegates, if we were that man & the road roller is our competitors, how fast we need to go to avoid being flattened. The answer is faster than 3, & we normally agree 6mph will be safe. I then point out that this is no good at all. To explain this I ask them to turn the clock back to 1962, the year I finished my apprenticeship & manufacturing was still a major part of the British economy. The man is a company called Norton, one of the world’s finest motorcycle manufacturers employing thousands of people, & the road roller is a Japanese company called Honda. If Norton were doing 6mph Honda were doing 1mph & were 100miles behind Norton, & posed no threat to them. I then write on the chart the current year, & ask where is Norton & the rest of our motorcycle industry. All gone, & Honda is the largest manufacturer of motorcycles in the world. What happened? We were that good & they were that bad, but we lost and they won. After a suitable pause, I make the point that success in the long term business race does not go to those moving the fastest, but those accelerating faster than everyone else in the race. It doesn’t matter if initially you are last, as the Japanese were in cars, cameras, electronics etc., as long as you improve/accelerate faster than everyone else you will win. The Japanese have a name for this acceleration/improvement process; it is Kaizen. It is their word for all the activities that continuously improve everything we do & create. Delivery. The Fastest and on time. And be giving them ‘Delightful Experiences’ in all their direct & indirect contacts with the supplying organisation. These measures (P.S.E and Q.C.D.D) must drive the elements of our Kaizen activities. Our future success is guaranteed if we can continuously improve these values faster than any existing or future competitor. Kaizen is about continuously achieving all these goals. The practice of Kaizen must also include all the activities that will avoid losing the improvements gained. I have learnt two fundamental rules of Kaizen from my study & practice of TPS/Kaizen in Japan (20 visits) & with my European clients (1100 workshops). They did not receive sufficient attention when TPS was translated into Lean thinking. This could explain the difference between Japanese & some western academic interpretations of Kaizen. 1) Can we remove it, before we improve it? We should not be improving activities & items that should not exist. This is often lost in the complexity of VSM. What cannot be removed should then be the potential target for improvement. 2) Maintain the gains, sustain the change. I speak from personal experience when I say this can be a challenge to the western mind, unfamiliar with the concept of Yang & Yin thinking. Once we have secured the improvement & ensured there will be no deterioration (YANG – Rigid thinking to standards is used); we can then press on with the continuous improvement process (YIN – Flexible thinking is used). It took me many years to get comfortable with this Yang-Yin idea. This second rule is essential to maintaining the improved situations. To truly understand Kaizen, I think it helps to remember the words of Archimedes; “Give me a lever long enough & I can lift the world.” 0ur people’s abilities are the lever to raise our organisation’s performance to world class levels & keep it there. Kaizen is a focus/fulcrum for its application.